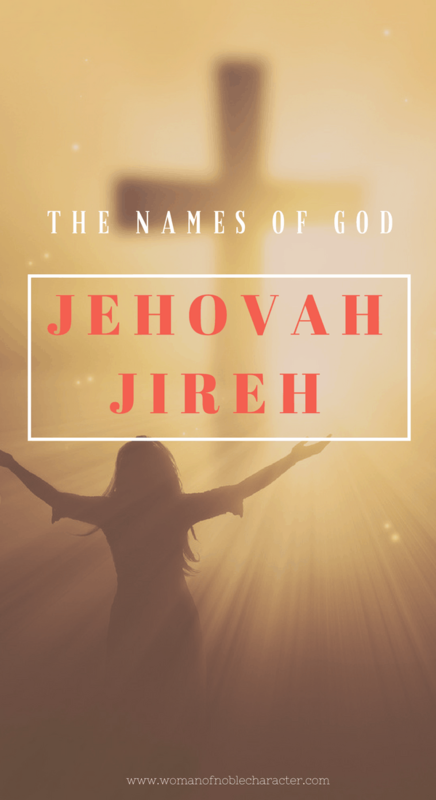 As we continue with our series of the names of God, I’m excited to share one of my favorite of the Lord’s names: Jehovah Jireh. The Lord Will Provide or The Lord Who Provides. 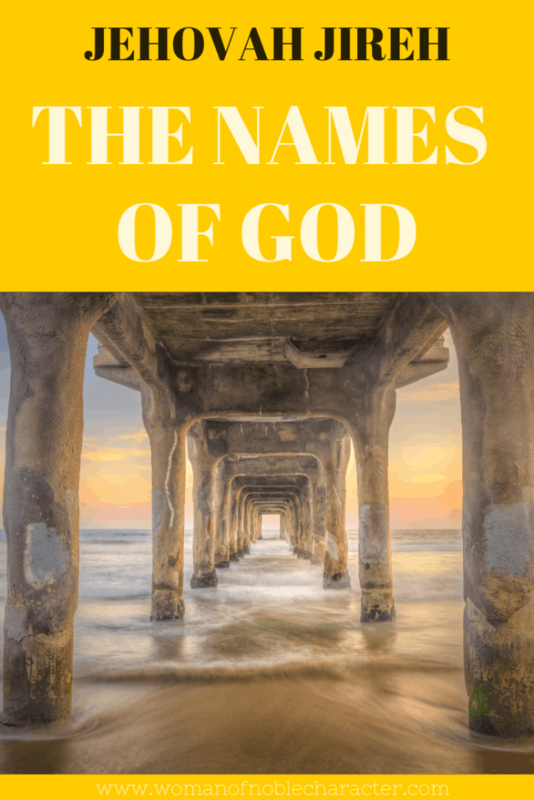 (Other posts from this site on the names of God include Jehovah Rapha, Jehovah Nissi, Jehovah Rohi, Adonai, Abba, Yahweh, Jehovah Elohim, Jehovah Shalom). 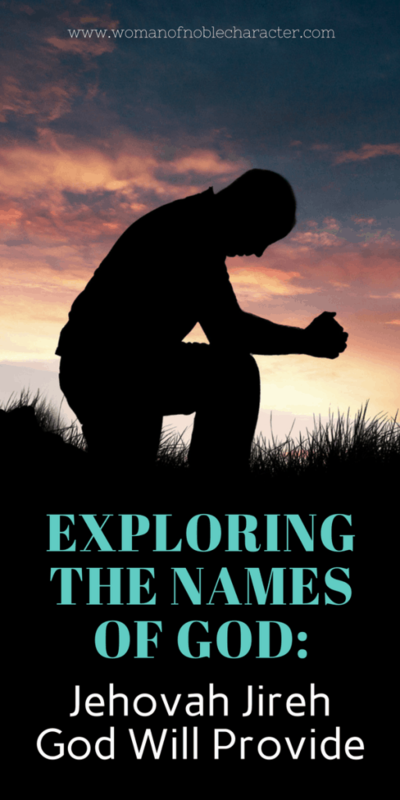 (For more on praying over the names of God and why we should study them, see this post). When Abraham raised the knife to take his son Isaac’s life, God stopped him. Abraham then noticed a ram that had been trapped in a nearby bush or thicket. He offered the ram as a sacrifice instead of Isaac. Abraham felt certain that God had provided this ram for this purpose and called God The Lord Will Provide. Jehovah-Jireh provided a sacrifice to save Isaac, and that action was a precursor of the provision of His Son for the salvation of the world. In Hebrew, the name is יְהוָה יִרְאֶה. The first word of the phrase is the Tetragrammaton (יהוה), generally translated in English bibles as “the LORD” or “GOD” in capital letters. Jehovah is a Christian anglicized vocalization of this name using the vowels of Adonai. The early Septuagint translation into Greek gives the meaning as “The LORD hath seen.”One Latin version of the Christian Bible rendered the name in Latin as Dominus videt (“The LORD sees”). The King James Version follows this meaning, as quoted above. However, some modern translations, including the NIV, render it “the LORD will provide”, amplifying the literal meaning along the lines of “the LORD will see to it”, and referring to Abraham’s earlier words in 22:8, “God himself will provide the lamb”. 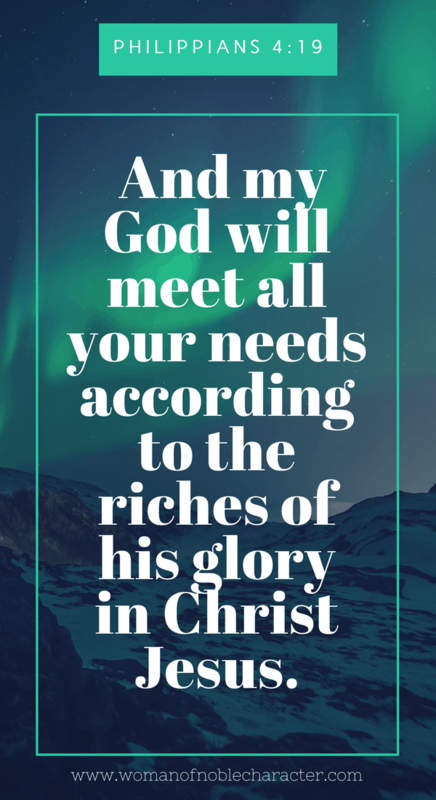 While Jehovah Jireh scripture references are minimal (the actual text “Jehovah Jireh” occurs just once in the Bible in Genesis 22:14), promises that God will provide are found throughout the Bible. Here are just a few. Isn’t it so comforting to know that God knows our needs before we do? He not only KNOWS our needs, but He provides them to those who believe in Him. God desires for us to carry out His will on earth. He loves you and He has a good plan for your life. He wants to bless you so you can fulfill His plan and purpose … so you can really enjoy your life. And in His Word, He tells us who He is and how we can access everything we need through Christ. The problem is, sometimes we miss out on what God wants to do in in our lives because we go to people, expecting them to give us what we need, instead of God. Now, God will work through the people He puts in our lives to help us, but we need to go to Him first and let Him determine the best way to meet our needs. Many of us, fall short, however, because we rely on earthly providers, instead of our Heavenly Father. Do these sound familiar? We plan for something, but don’t invite God to the planning session. We expect someone else to do something, get something for us, love us. but don’t consider God’s plan for our lives. When we seek things instead of God, our focus is not in the right place. Our relationship with God needs to be our number one priority all the time, because everything we need is found in Him. When we seek God to know Him more and to learn the right way to live, then we can have confidence that He will take care of everything that concerns us and meet all of our needs. I have so many stories where God has provided for me, but I want to share two, very personal ones with you. About ten years ago I was in a bad marriage. My husband was not a bad man, but he was an alcoholic which resulted in some poor decisions. He did not have a relationship with Christ. Every day I prayed that God would change his heart. I had a very close personal relationship with Christ at the time. 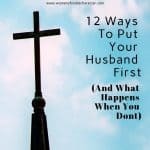 When he left me and my sons and I was single again, I prayed that God would give me a Godly man. I ended up in a difficult relationship that caused me many struggles and heartache. I wondered why God didn’t answer my prayers. Why didn’t He want me to be happy? 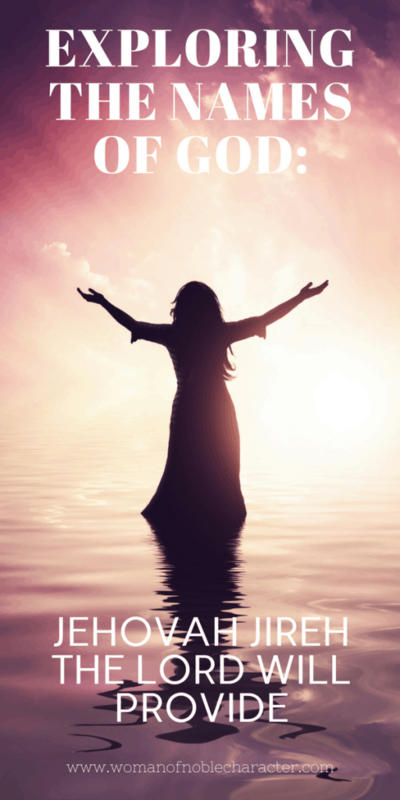 During this time, I stopped going to church and ceased seeking God in all I did. Looking back THAT was why He didn’t intervene! compassionate, giving, selfless and loves God with all of his heart. He helped fan the flames of my own passion for our King of Kings! God DOES want us to be happy. He DOES want to give us what our heart desires, IF it is according to His will and if we are seeking Him first. In 2015, Mike lost his income. I asked him to move into my house to help him out until he could get back on his feet. I own my own home and received a monthly pension from my late husband. (He passed away when we were separated as a result of his alcoholism). Mike and I knew that by living together, we were willfully sinning. It weighed heavy on our hearts and we sought counsel of Christian friends and finally our pastor. If we married, I would lose my pension. How could we survive? Yet, we wanted to honor God and please Him. Our pastor reminded us that by pleasing God, He would take care of us. He also reminded us that our current situation was NOT pleasing to God. We prayed and asked God for guidance. He answered very quickly and we knew that we were to get married. That very night, Mike moved into a spare bedroom in our home and the wedding was scheduled for May 14th, 2016. Each night, we watch TV together and do our couples devotion, then we retire to our own rooms. Yes, I lost my pension, but God knew that we needed some help. Mike is a licensed Master Plumber. Within a few days, calls started coming in for work for him. He was going into business for himself – God took care of that and has been providing steady work ever since. For me, in addition to Woman of Noble Character, I am a Human Resources Consultant. Within a few days of our decision, I started to receive more calls and requests for proposals – I hadn’t even sought them , yet! Now I have ample work and we are comforter knowing that we will be just fine, financially and spiritually. 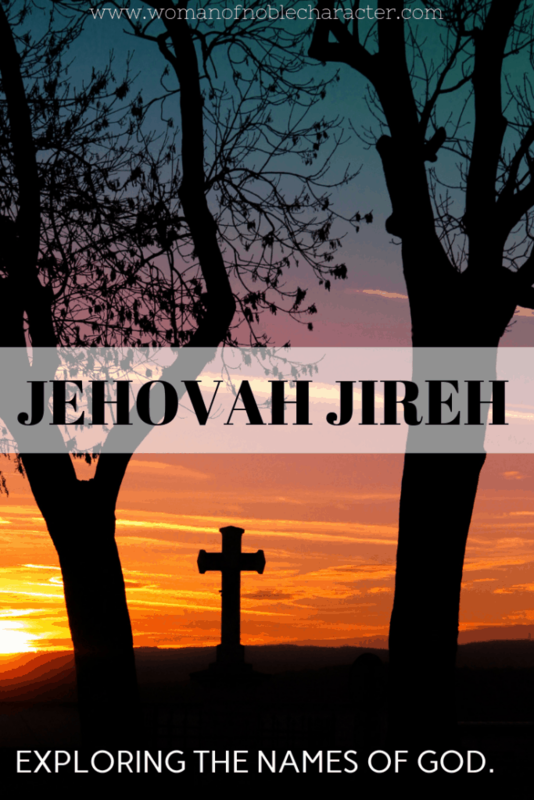 Jehovah Jireh – The Lord Will Provide! God had a plan for me to meet Mike in His perfect timing and when I sought His face! He also knew that one day we would be married and that our marriage would be a testament to His perfect love. We sought to honor Him and we are now enjoying the blessings that He has so graciously provided for us. Another way that God provided for me was through my adoption. I’ve shared that story here. 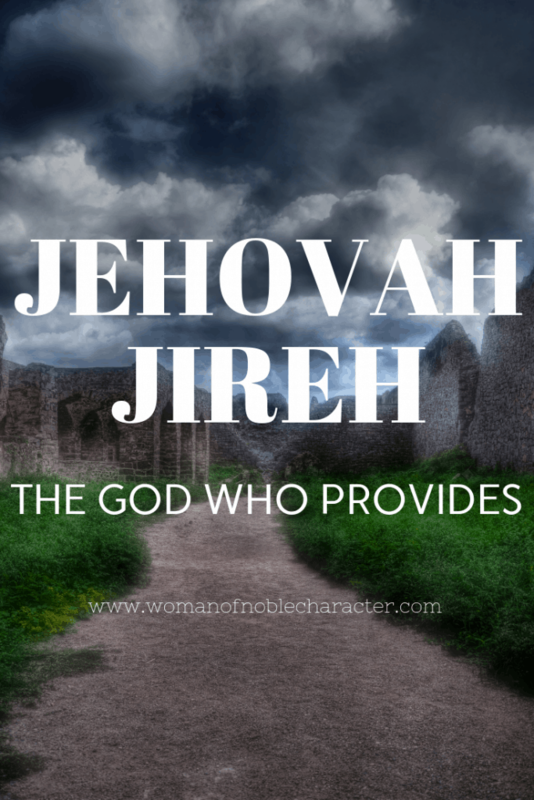 How has Jehovah Jireh provided in your life? Was there a time that hope seemed lost but God had a plan? I’d love to hear your story! 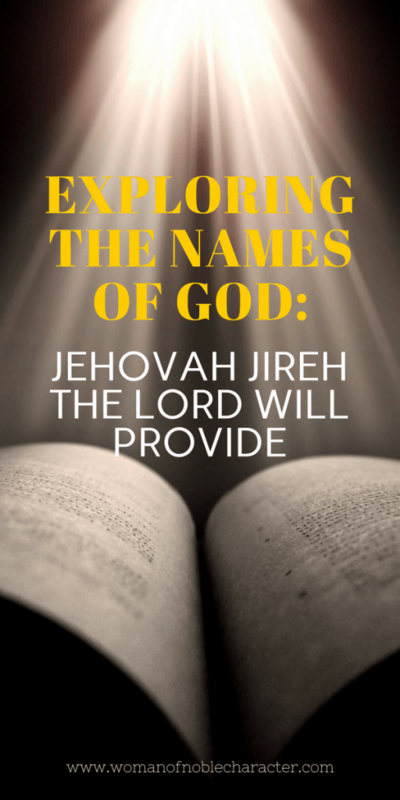 Studying and praying the names of God, including Jehovah Jireh, can expand your love of Him and His promises. We thank you that there is no situation that is out of your control. 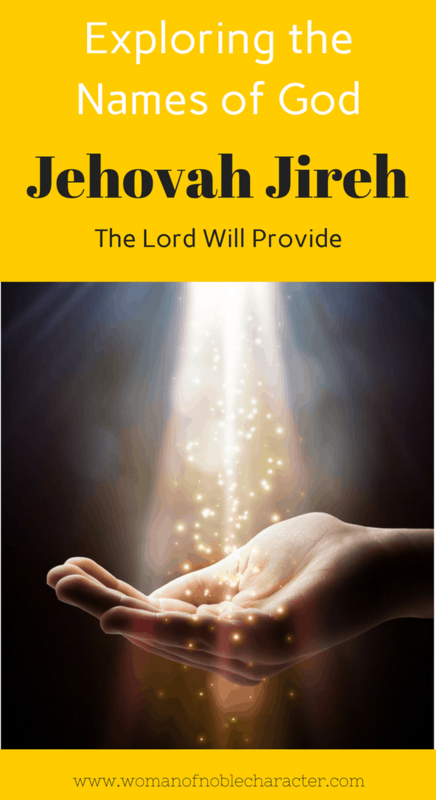 You are Jehovah Jireh – the Lord Who provides. We thank you that you hold everything in your hands and give us what we need. We also thank you that you know our needs before we even ask, before we even come to you. You know our needs even when we don’t. Heavenly Father, you know our concerns and worries and and you have a plan for us. You have the solution, you have the provision. Only You can move mountains to make a way for situations that, we, as humans, think are out of control. We ask for your answer, according to your plan and in your perfect timing, to be given for every need that burdens us. Forgive us for doubting you, for worrying, and for thinking that we have the answers. Jehovah Jireh, help us to trust you completely and increase our faith. Remind us that you are able to accomplish far more and do far greater, than we ever thought possible. We thank you, in advance, for your miracles, for your provision. Thank you for blessing us abundantly. More than we could ever imagine. We trust you this day, and every day, and are so grateful for your Power and joy that fills our lives. Thank you for teaching us to be content in all circumstances. We love you Father God, Jehovah Jireh and we put all in Your hands. I love this book by Mary J Nelson (no relation!) filled with story-based meditations and prayers to our Jehovah Jireh. Seek first his Kingdom and all these things shall be added… Thanks for sharing your stories! It’s so important to look to HIM as our source and provider, honoring Him in our every decision. I too was married to an addict, then became a single parent. God provided an AMAZING man who stepped into my life and took on the role of father to my son. My story is lengthy with lots of twists and turns, but through it all, GOD PROVIDED. Isn’t HE amazing? He knows what we need – even when, especially when, we don’t! Thanks for stopping by! Thank you for sharing your personal story of provision. I love how God provides exactly what we need when we need it. He IS the Lord Who Provides! He knows what we need and when we need it 🙂 Thanks for stopping by! Hello! 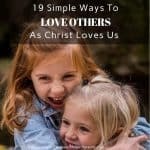 Thank you for this wonderful content, I have been deeply touched by your blog… I have a deep passion for the Word of the Lord as it has been my EVERYTHING through the different seasons of life. 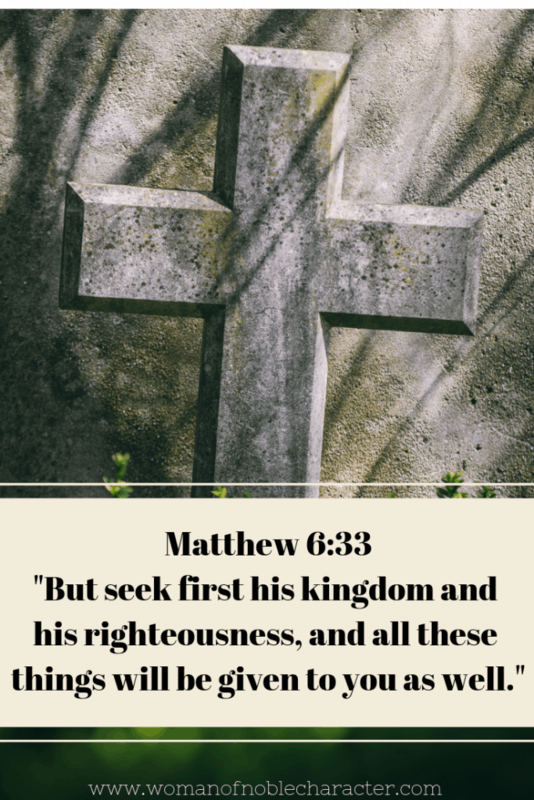 The following statement “When we seek things instead of God, our focus is not in the right place” is so true and we need to constantly check our hearts and make sure He is our ultimate goal and not things… As His word promises seek His kingdom and everything else will just be given to us. Sweet sister! I’m so glad that you are enjoying my site. He is my everything, too – without Him, we are nothing! Amen! Thank you for stopping by! 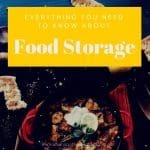 God’s provision is a wonderful thing to meditate on and there is so much one could think about – examples from the Bible as well as our own life. I think your example was excellent and really showed how God strongly supports those who follow his ways. A very encouraging post, thank you :-). Yes, He does provide in every way! Not always how we want or expect him to. He knows what we need! Wow! Thanks for sharing how God provided. God blesses obedience! Great testimony! Our Jehovah Jireh will always honor His Word! These are neat stories of how God has provided for you!! I am curious to know what a HR consultant does from home!